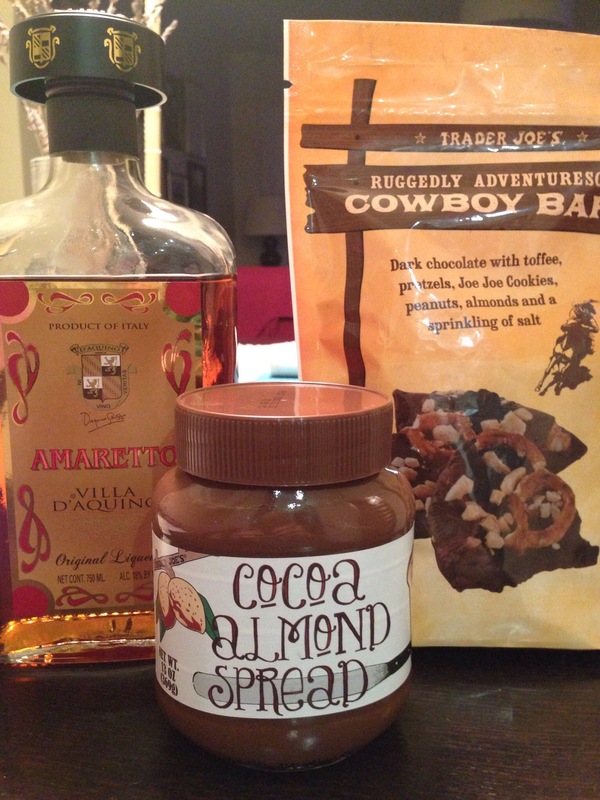 A subtle amaretto and brown sugar custard base gets a burst of chocolate from cocoa almond spread and chocolate bark. It’s sure to be a crowd pleaser! For my latest diabolical ice cream creation, I drew inspiration from my favorite nocciola (hazelnut) and amaretto Italian gelato flavors. As I’ve found home ice cream makers and residential freezers distort the delicate texture of a milk-based gelato, I’ve used my standard custard base. The thickness of a cooked, egg-based custard creates an ideal, soft texture and rich product that you’ll enjoy long after it hits the freezer. For additional texture and an intense burst of chocolate, I incorporated chocolate bark, which is usually less brittle than solid chocolate. Trader Joe’s Cowboy Bark is a personal favorite of mine, with a sweet-salty smattering of chopped nuts, pretzels, and toffee to make it extremely addictive and fun. If you’re avoiding gluten, find another type of bark to suit your needs. In a medium pot over medium heat melt the butter. Quickly whisk in the brown sugar to form a paste. Gradually add the four tablespoons of whipping cream whisk (set aside one cup of cream). Whisk in the amaretto and vanilla and allow to bubble/boil for 5-10 minutes. The liquid’s volume should reduce by 1/3 to 1/2. Whisk in the milk and remaining cup of whipping cream. Bring to a boil. Meanwhile, separate eggs and place the yolks in a small mixing bowl (save or discard the egg whites). Beat briskly with a wire whisk (small bubbles should appear) for about 30 seconds. 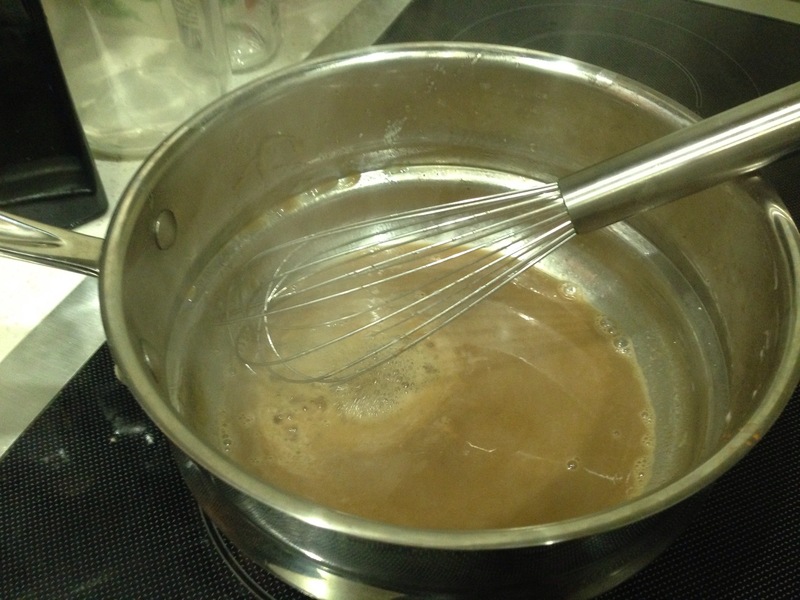 Gradually add the granulated (white) sugar and beat with the whisk until sugar is more or less dissolved. When the milk mixture has reached a boil, allow it to boil for 2-4 minutes; it should begin to expand or become frothy. Remove from heat. 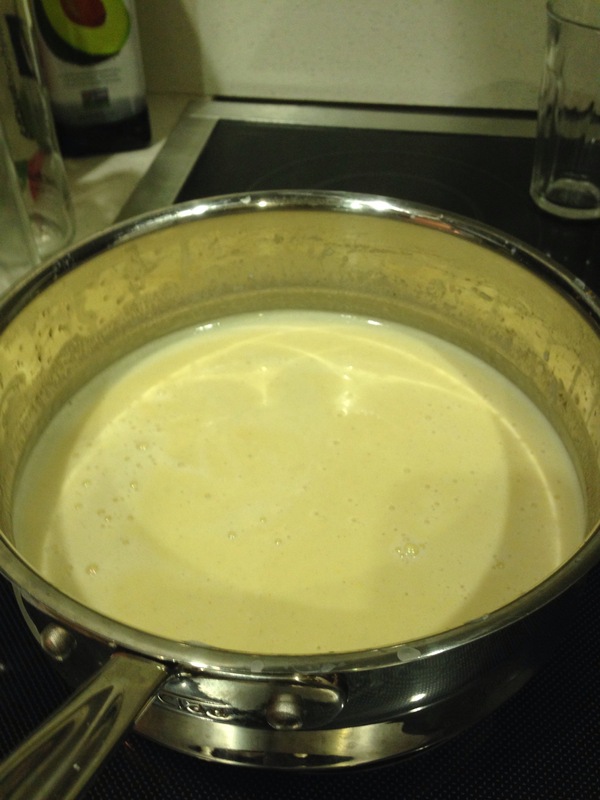 Pour about 1 cup of the milk mixture into the eggs, whisking in gradually to temper the eggs. Add in another cup of the milk mixture to the eggs, whisking continuously. 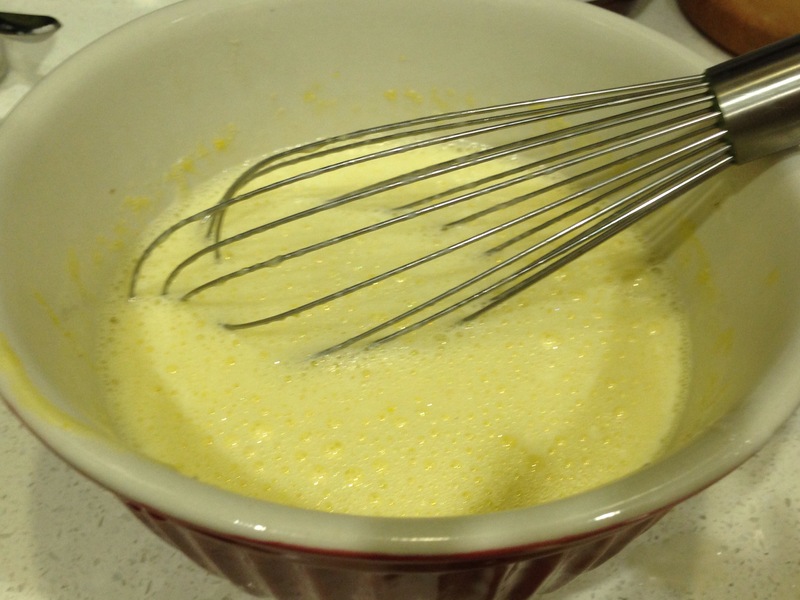 Pour the resulting milk-egg mixture into the pot with the remaining milk and whisk to incorporate fully. Return the pot to heat. Whisking occasionally, bring to a slight boil; remove the pot immediately from the heat to prevent curdling. The custard should now be thick enough to coat a mixing spoon. Cool the mixture for about 15 minutes at room temperature. Cover and refrigerate for 1-2 hours or until thoroughly chilled (you can chill overnight or for 24 hours). Whisk periodically if possible during the first hour of chilling. You can shortcut the chilling by placing the custard in the freezer for about 30 minutes, but stir/whisk every 5 minutes to prevent a skin from forming and the custard from freezing to the metal. Outfit your ice cream maker and pour in the custard. Follow instructions for your appliance and begin churning. Meanwhile (if not churning manually), roughly chop chocolate bark into 1/2″ (approx. 1.5 cm chunks). About 5-10 minutes from completion of churning, or when the ice cream is uniformly firm but still churning smoothly, add the cocoa-almond spread, a few tablespoons at a time. Next, complete the ice cream by adding the bark pieces directly to the mixture. Transfer to airtight containers and freeze.